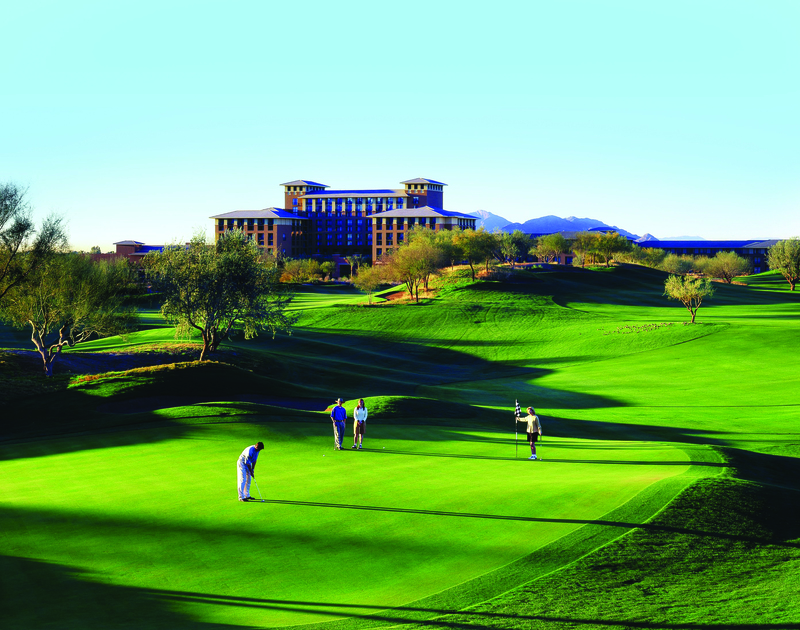 The Scott Miller-designed Westin Kierland Golf Club with the resort in the background. 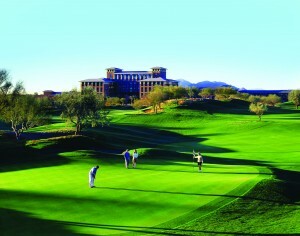 In the heart of “new” Scottsdale is The Westin Kierland Resort & Spa. It’s a luxurious resort with a world-class, full-service Agave Spa. With 732 rooms, the resort’s architecture uses materials and colors meant to mirror Arizona’s Grand Canyon. Each room is outfitted with the deep-sleep inducing Heavenly Bed®. Its 27 golf holes, designed by the estimable Scott Miller, offers wide fairways and well-protected greens that make for fun rounds, the essence of resort golf. It’s also a place where management isn’t afraid to unleash and support employee enterprise, and experiment with different ways to entertain and meet the needs of guests. 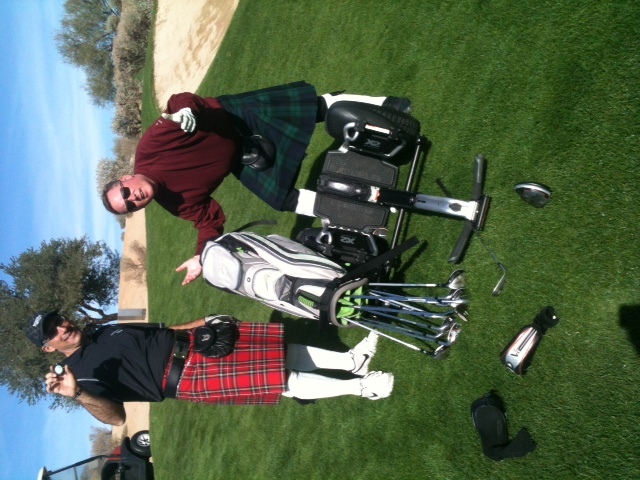 Jeff Wallach, the crashed Segway and Kierland Director of Golf Kipp Bates. The golf program is managed by Troon Golf and also features wrinkles not found at many – – or any – – other courses. One is the daring use of Segways that can carry a single golf bag. Players can drive directly to their ball, which speeds up play. Learning to drive a bag-laden Segway, however, is a challenge of a different sort. Indeed, on our first hole of play, Jeff Wallach thought he’d stopped his Segway, only the “leader in green personal transportation” kept going on its own, jumping a curb, tipping over and driving itself down a grass slope, busting off the head of a rental driver and leaving a trail of tees, glove gloves and other accident detritus. Another wrinkle here is the “Scottish Golf Experience,” in which players can wear rented kilts, sporrans, belts and socks. 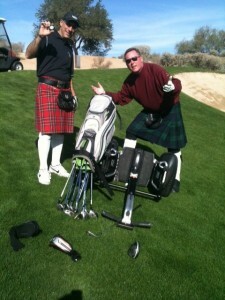 (The kilt is surprisingly comfortable and no, we didn’t go commando.) The idea is to time the round so that golfers come to the last hole near sunset. That’s when Michael McClanathan plays the bagpipes – – as he has nightly for nearly a decade – – next to the lake by the resort’s patio. There, the kilt-clad golfers can listen to him play while sipping several varieties of Johnnie Walker Scotch, and if so inclined smoke a cigar. Wearing the kilt reminded me of a wonderful Scottish Drinking Song that I only recently heard, the payoff to which is suggested in the above title. Click on Scottish Drinking Song and enjoy.